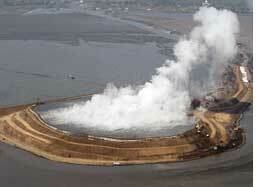 the world's largest mud volcano in Indonesia is collapsing under its own weight. Spewing sludge containing hydrocarbons, carbon dioxide and nitrogen for two years now, Lusi, the volcano, has submerged about 700 hectares in Java throwing life out of gear for the people. By now, the area has subsided by about 30 m, which has created an ovoid-shaped sag that is sinking further. Geologists who have studied the phenomenon say this could go down further by 140 m in the next decade. The research is fundamental in understanding the final impact of Lusi and predicting its next development stage. The subsidence data will help scientists assess how long the volcano will continue to erupt and how much of the local area will be affected. This could help prepare measures to minimize its overall impact, said Richard Davies, co-author of the study. The study carried out by researchers of Durham University, uk, and the Institute of Technology, Bandung, Indonesia will be published in Environmental Geology. The researchers found that most subsidence in the submerged area was gradual, at around 0.1-4 cm per day. But of late, subsidence had increased. In March, geologists observed subsidence of up to three metres overnight. They monitored the subsidence using fixed global positioning system and satellite measurements after the Lusi erupted the first time in Porong in May 2006. Since then, about 18 million tonnes of toxic mud has spread, which local authorities have tried to contain through dykes. "The subsidence is due to the huge weight of mud, dams and collapse of rock strata due to excavation of mud from the subsurface," said Davies. Collapsing of the entire area indicates there are new faults forming giving rise to land uplifts in some parts of Porong, he adds. Satellite imagery showed land uplifts of upto 0.09 cm a day in areas outside the mud edifice. Such sudden collapses could be the beginning of formation of a caldera, a large basin-shaped volcanic depression, the study says. The central collapse may be good news since it will make room for more mud on the surface and take the pressure off the dykes that have breached several times before. But subsidence and uplift around the submerged zone will impact the local community more, say the scientists. Ground displacements are already causing cracks in the walls and floors of houses. A gas pipeline had ruptured in November 2006 leading to an explosion that killed 13 people. A bridge had to be dismantled after it developed cracks and railway tracks have been moved out of line. "As the area continues to subside, we may also see rivers divert their course," says Davies.